Mark your calendars for Thursday, February 2, 2017, and save the date! NEW FOR 2017: Also available at the event this year: Rockfish Public House will be on hand with an oyster shucking station for those who wish to purchase oysters. Look for them in the Performance Kitchen area. Please note that the oyster shucking station is not included in the ticket price. This is an added featured this year and will make a nice pairing with Guinness. Tickets are $25 and are now available for purchase online through January 26. Best Float: York Fish & Oyster Co. 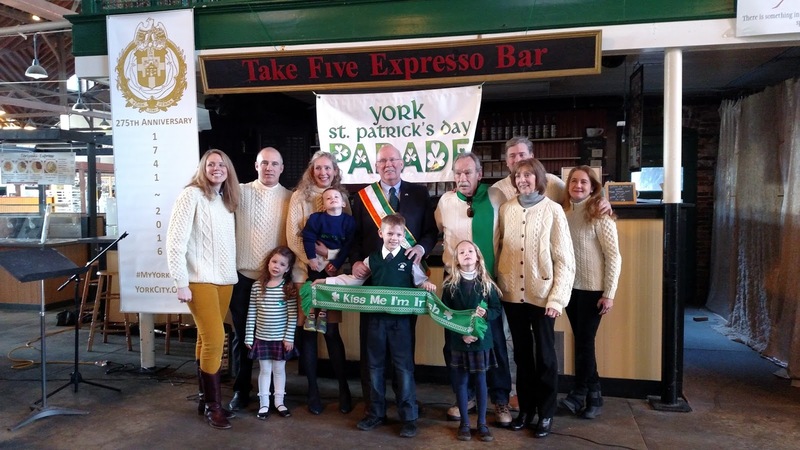 The York Saint Patrick’s Day Parade Committee is pleased to announce Ward Walsh as Grand Marshal of the 33rd Annual York Saint Patrick’s Day Parade, to be held on Saturday, March 12, 2016, along Market Street in downtown York. Ward is a graduate of St. Patrick Grade School, York Catholic High school (’64) and attended the College of William and Mary, where he met and courted his bride, Kathleen. They settled back in York when Ward started his own company, IMC America, Inc., and raised three children here – Ned, Mieke and Reid. All three are also graduates of St. Patrick and York Catholic and also make York their home, allowing Ward and Kathleen to spend plenty of time with their nine grandchildren. An Irishman to the core, Ward is a long-time enthusiast of the parade and he and his extended family, Clan Walsh, have marched as a group in the parade for many, many years. Beginning at the very first York St. Patrick’s Day Parade, when Ward grabbed his children, a poster board and their faithful dog, Molly (dyed greed for the occasion), a tradition was soon born to include the extended Walsh family. Through the decades the family gathers again and again to enjoy their favorite holiday – at the parade and in the celebrations to follow. Ward is the oldest of eight children of Bud and Sheila (Duffy) Walsh, and has 35 first cousins to boast, not including his own siblings (like we said, it’s an Irish family!) When the Clan gathers, they gather en masse and have a great time doing so and the St. Patrick’s Day Parade is no exception. Outside of work and family, Ward is an avid swimmer and cyclist and supporter of his alma maters (YC and William and Mary both) as well as the York YMCA, where he has been a member since he was a boy. He counts his high school and college buddies as well as his swimming and cycling crew among his closest friends – and his friends number almost as many as his family! He is loyal to every one of them to the last. He is also a faithful parishioner of St. Patrick’s where you’ll find him with his Uncle Jim Walsh each Sunday at 8:00 mass after which he takes communion to elderly who are unable to attend mass in person. 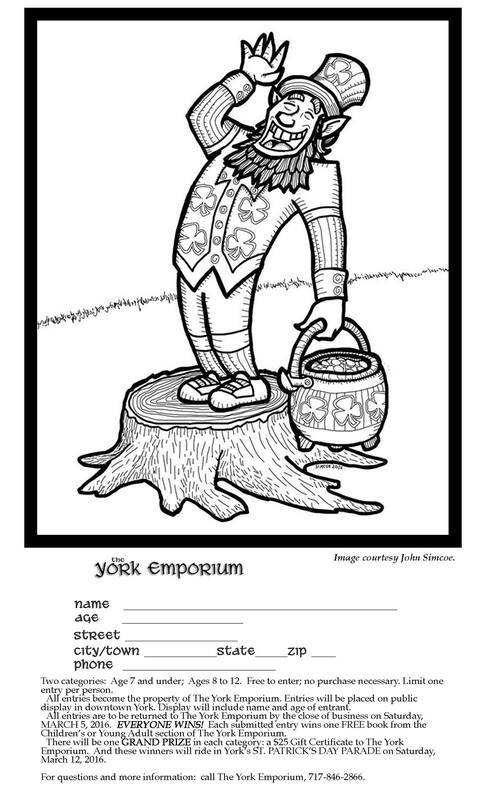 From Cork to York is the slogan of Clan Walsh as they march in the parade, and we think that is pretty close to the truth! We know at the least Ward and his siblings are genuinely 100% Irish – as all of his ancestors can be traced to the Emerald Isle. On his father’s side, Bud Walsh was the son of Edward and Alice (McMahon) Walsh. Alice hailed from Massachusetts, where her father, first generation James Francis McMahon (who married Henrietta Dunn) was the fire chief of Boston. Ed Walsh was the son of Margaret (Shields) and Edward R. Walsh, and also came to York from Massachusetts. His grandparents, William H. and Honora Walsh and Patrick and Mary (O’Keefe) Shields were all born in Ireland. On the Duffy side, Sheila Duffy Walsh was the daughter of James T. Duffy of Marietta and Margaret (Gaul) Duffy of Houghton Michigan. Jim Duffy was the son of James Thomas and Mary (Malone) Duffy. His father, in turn, was Colonel James Duffy, Jr., whose parent James and Catherine (Sheridan) Duffy emigrated to Lancaster from the homeland, specifically Donegal. Margaret Duffy was the daughter of James and Margaret (Ryan) Gaul – whose family was from Tipperary and Kilkenny Counties.